04/02/2015- Durango- Ballot drop off box at the Durango City Clerks office. Something important has been going on this summer at the Durango Farmers Market on Saturday mornings, in addition to the string quartets and the human-powered bicycle blender. In 2016, Colorado voters approved Amendment 71. 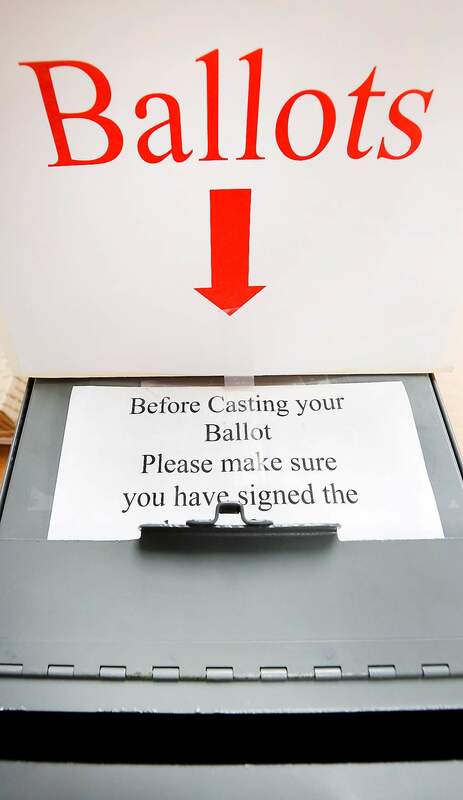 Before that, to get a citizen initiative onto a statewide ballot required signatures from 5 percent of the number of people who voted for the secretary of state in the last general election. Now it takes signatures from 2 percent of registered voters in each of the state’s 35 Senate districts. No longer can Front Range voters alone determine the fate of an initiative. That’s why you may have seen the paid signature-gatherers this summer at the market, typically half a dozen, each offering a petition or two. It’s a glorious sight, especially if you like your democracy messy, the way radicals like Paine and Jefferson envisioned it. The only way to keep all of the people from falling into error is to let some of them do battle with others in a contest of ideas. That’s what the initiatives are: paper lances. There are just short of a dozen distinct petitions at large now. One would raise the state income tax to provide more funding for education. Another requires that oil-and-gas drilling be set back from homes, schools and neighborhoods by at least 2,500 feet rather than 500 feet. A third says that the state must compensate property owners, such as mineral rights owners, if the state takes their property by, say, increasing the setbacks. And then there are petitions to raise taxes to pay for roads, to use bonds and not taxes to pay for roads, to put limits on payday loans (taking them down to only 36 percent annual interest), to make healthcare billing more transparent, to ban the sale of smartphones to children under 13, and – one of our favorites – to change the state constitution to allow higher campaign contributions if a millionaire is in a race. What we like about that last one is that it takes a perceived problem, the existence of the wealthy and self-financing in our politics, and attempts a very imaginative solution that we like to think was dreamt up by several people who were stoned in a dorm room. Currently, the Colorado cap on donations to candidates by individuals is $1,150, less than a third of the national median (and that’s good!). However, candidates can donate as much as they please to themselves. Under the new proposal, if a candidate gives herself more than $1 million, all other candidates in that race would have their donation cap quintupled, to $5,750. If the object of the drafters was to counteract the presence of big money in a race, why would you flood the race with more money? But we’re getting ahead of ourselves. The deadline to turn in signatures is August 6, which means this will be the last weekend you can sign any or all of these petitions at the market. By signing one, you’re not voting to enact it. You’re voting to put it on the ballot. Ideally, once it’s there, the real contest of ideas begins. That’s when we look forward to someone changing our minds about this new millionaire’s rule.